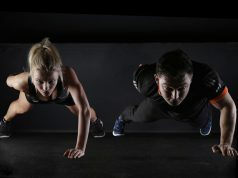 If you are relatively new to health and fitness, or bodybuilding, and you are using the internet as your number one source for fitness know-how, then you might have unknowingly fallen victim to the so-called “fitness fiction” or more commonly known as fitness myths. Who or what gave rise to these fitness or bodybuilding myths is beyond me. They have been around for years and something tells me that they’ll stick around for a very long time – confusing the hell out of beginner and intermediate fitness enthusiasts who want nothing more but to achieve the body of their dreams. Well, the good news is that today we are going to debunk some of the most famous fitness and workout myths out there and help you have a more realistic view of your fitness goals and hopefully help you out with your body transformation goals. The amount of people that I have seen in the gym wearing one of those ridiculous ab belt products is laughable. Repeat after me: Spot. Reduction. Does. NOT. Exist. It’s a myth! Unless you use liposuction. Ask yourself, have you ever seen a lean athlete that wasn’t lean all around. The answer is probably “No”. Just try to imagine a fitness model with shredded abs and then with fat or chunky arms and legs. There are certain areas that are harder to reduce: those are usually the abdominal region for men and the abdominal and thigh region for women. They are the first place where we store body fat and last where we get rid of – so it’s basically a first come last serve queue, when you think about it. But these complicated areas cannot be reduced through spot-reduction, but rather through an improved workout and diet program. Once you reach the point where losing body fat becomes really hard then that means that your body is resisting to do so, because you are entering the low body fat region. Probably the most well-known and applied myth nowadays is the whole idea that your weight is an accurate measurement as to how fat you are. 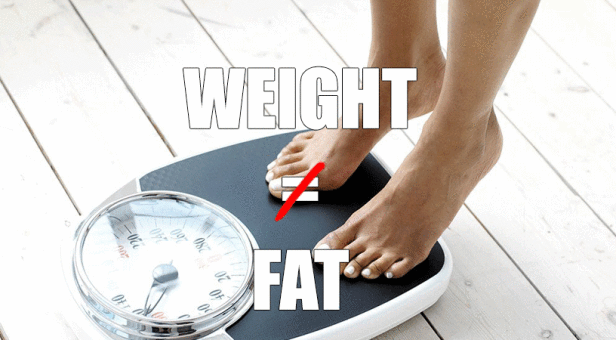 This is why one of the most popular categories in the fitness industry is WEIGHT loss, instead of FAT loss. When you think about it, it’s completely logical – if you are overweight, or if you have a high percentage of your bodyweight that is body fat, and if you lower your total body weight through dieting and exercising then that should mean that you are losing body fat, right? The main problem is that there are a lot of elements that come into play when determining your total body weight – muscle, bone, water, body fat, etc. To simplify, the reason why you are losing weight might be because you’ve lost muscle mass due to overtraining or a poor diet, which puts you in catabolism (muscle loss); Or, it could be because you’ve lost bone mass due to poor lifestyle choices and a weak diet; Or, you could actually be losing body fat. This applies the other way around – I have read many forums where ladies are discouraged from their fat loss program, because they have gained weight even though they have a really good diet and quite the impressive workout regime. Well, as it turns out the weight that they have gained is actually muscle mass and not fat. Their high activity at the gym and their nutritious diet is causing them to gain muscle, which results in a higher number on the scale. “But, John, what are we suppose to follow then?”, you ask. Well, simply enough, just look at yourself in the mirror, measure your areas and then record your results. This way you will have a clear idea whether your are gaining muscle weight or body fat and whether your losing body fat or any other form of weight. Carbohydrates are essentially your primary source of energy. They are an important element to muscle growth (the more muscle mass you have the higher your metabolism is) and they are also vital for your performance at the gym (i.e. the lower your carb intake is, the lower your overall intensity at the gym is going to be). 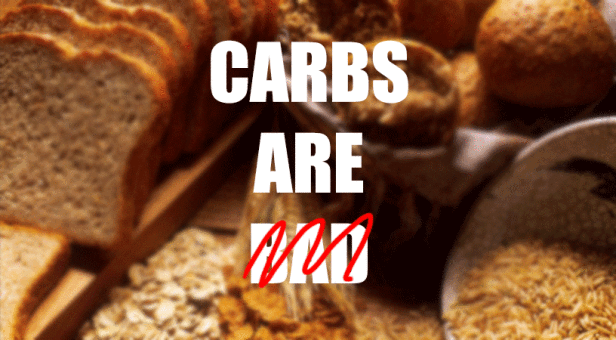 It is true, however, that carbs are the ones to blame when it comes to fat gain. If you eat a lot of carbs on a daily basis and NOT exercise nor be active, you are going to gain body fat. Simply because your body is going to store all of the excess calories as fat for later use. The timing of your carbs is also important – a rule of thumb is to eat 40% of your carbs before your workout and 40% after your workout. The remaining 20% just need to be broken down throughout your day. Eating as few carbs as possible at night because that is when your metabolic rate is at its slowest. Foods rich of complex carbohydrates (good/clean carbs) are also packed with dietary fibre, which makes you feel full (satiated) and lower your cravings for junk-foods. Every person has went through the phase where he/she believed that doing crunches will actually help you get visible abs. The problem is that is total none-sense. The only way that you are going to get visible abs (or visible muscles for that matter) is if you lower your total body fat percentage, which causes your muscles to show underneath. 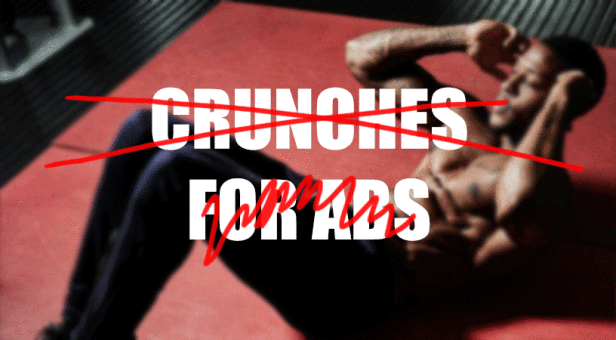 To be completely honest with you, I personally believe that crunches, or any other ab exercise, is completely redundant and a waste of time. You’re better of doing compound exercises that activate your whole core. Literally, the only reason why our body sweats is so that it can reduce its temperature and combat the heat. It has nothing to do with intensity. I think that the media is to blame here with all of their movies and magazines telling people that if you’re not sweating, you’re not working hard enough. There are people who sweat a lot and then there are people who don’t sweat as much (I am one of them). Fat is oxidised inside your body and will not leave your body in the form of sweat (yes, there are people that actually believe this to be true). 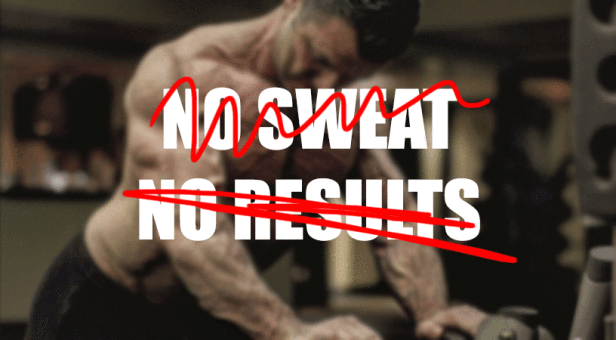 In other words, there is no need for you to keep wearing that hoodie inside the gym. Unless you are doing some variation of Yoga that is really intense, it’s not really going to help you burn a lot of calories, simply because it doesn’t require much oxygen. Yoga also DOES NOT stimulate muscle growth the same level as weight training does. 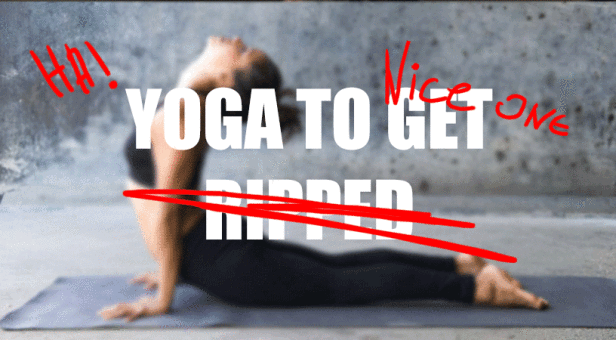 All of those ripped dudes and girls that are doing yoga, are probably hitting the gym on a regular basis and enjoy doing the Forward-facing dog just to relax. Don’t get me wrong! 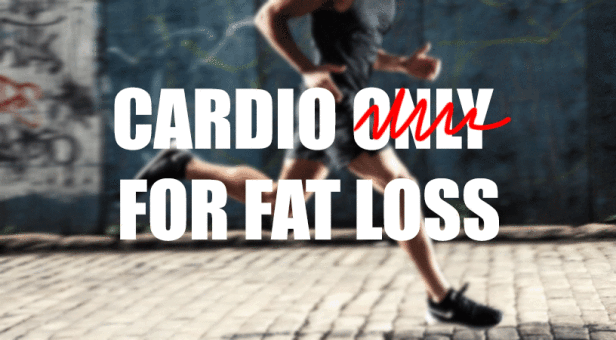 Cardio is a great way of shedding off those extra pounds of body fat, but it’s definitely not the only and best way of losing fat. I’m a big fan of compound exercises and I personally believe that if you are doing more of them you have a much higher chance of lowering your overall fat percentage. Not to mention that they are great for overall symmetrical muscle growth, which really helps you develop an aesthetic physique. What’s even better is that due to their high intensity nature, they help increase your metabolic rate for hours after leaving the gym (yes hours). What that means is that you will be burning fat while sitting around, watching TV, playing something on your computer or whatever it is that you do after hitting the gym. Quite amazing when you think about it. Obviously, once you have a clear and distinct understanding of what works and what doesn’t and will help you lose fat or gain muscle, then you can REALLY start improving your physique. There is nothing wrong with fallen victim to these myths and fantasies. We’ve all went through it. Companies and online fitness gurus mask them really well so that they look like facts just so that they can earn money out of your desire to have a better body. We all want the easy way out – Buy this expensive belt, put it around your belly, and within a week you will have visible abs!!! It’s that easy! What everybody needs to remember is that fitness or bodybuilding is a slow and continuous process. It’s where those who the most patient and consistent are those who win the race. Or as I like to say: “It’s not a race, it’s a marathon”. Let me know in the comments below have you ever fallen victim to a fitness myth and what was it. Also, leave any proposals for other fitness and workouts myths that I have not included in this article that I can include in the next now – I’m planning on making a Part 2 as there are quite a lot of myths in need of debunking. I hope you have enjoyed this week’s articles as much as I did writing it up! Give it a like and a share to spread the word about fitness myths! Until next week!